Natural tropical Peat Swamp Forests (PSF) are important for their rich biodiversity and because they represent important carbon pool. However, PSF are decreasing due to conversion into farm land, by excessive draining, the use of shifting cultivation on a large scale, illegal logging and peat fire. This increases the interest for mapping such environments as they are recognized as an important source of carbon released into the atmosphere. Airborne laser scanning (ALS) has the ability to measure the vertical and horizontal structure of forest vegetation. The aim of the research is to demonstrate how measures derived from small footprint airborne Light Detection and Ranging (LiDAR) data can be used to investigate the relationships between tree height represented by the digital surface model (DSM) and the difference to the digital terrain model (DTM) to estimate the above-ground biomass (AGB). The depth of peat fires can be analyzed too and the dependence of tree height and peat slope. The test site is a typical PSF landscape located in Central Kalimantan (Indonesia) near the provinces capital Palangka Raya. In August 2007 we mapped by helicopter different PSF locations with Riegl LiDAR Technology LMS-Q560 in the Block C of the Ex-Mega Rice Project (EMRP) and in the Sabangau National Park, known as CIMTROP transect. In each LiDAR transect we tested different sample plots sizes in relative undisturbed areas ranging from 50x50m to 100x100m along the flown acquisition in a minimum distance of 200m each one (Boehm et al. 2010). In the fire determination we only account for the lowest values of the DTM in order to minimize the inclusion of the return signal coming from tree trunks and branches lying on top of the peat surface. The DTM backscatter in PSF through the canopy was 1% - 3% of the total Laser beams. We adopted a similar procedure for the DSM where we account just the signal coming from the tree canopies. During the data analysis linear and non-linear regression functions were then used to predict the relationship between tree heights and peat slope. In each sample plot we calculated the peat dome slope and the tree height and we evaluate linear regression between both parameters. Our results showed that: a) the tree height increases by approximately 5m if the peat dome slope increases from 0.5 to 1.5m pro mille (m/km) from Sabangau River to the peat dome; and b) there is a relationship between both variables (r2≥0.60) that may be related with the permeability, interflow, water storage capability and nutrient availability in the domes. Results showed that the ABG regression analysis of the 100mx100m samples measured parallel to the Taruna channel ranged from 85 to 390 Mg/ha which has to be verified by field analysis. (Lefsky et al., 1999). The 2002 and 2006 fires on the two areas in Block C showed a fire depth varying from 15cm to 30cm. An extrapolation of the fire damages was done using ancillary Landsat scenes of 2007 to the entire Block C and approx. 150 Mio ton of C were release to the atmosphere in 2006. This LiDAR-methodology can be used in the frame of the Reducing Emissions from Deforestation and forest Degradation (REDD) knowledge of tropical forests. In a near future we intend to conduct regression analysis considering the field-measured stem volumes against together with LiDAR-derived tree height and Ortho-photos. Additionally a second flight campaign over the same forest area would give multi-temporal information about vegetation growth or loss. - Lefsky, M.A., et al., 1999, LiDAR remote sensing of the canopy structure and biophysical properties of Douglas-fir western hemlock forests. Remote Sensing of Environment, 70, pp.339–361. - Boehm, H.-D.V., Lieseberg, V., Frank, J., 2010, Relating tree height variations to peat dome slope in Central Kalimantan, Indonesia using small-footprint airborne LiDAR data. 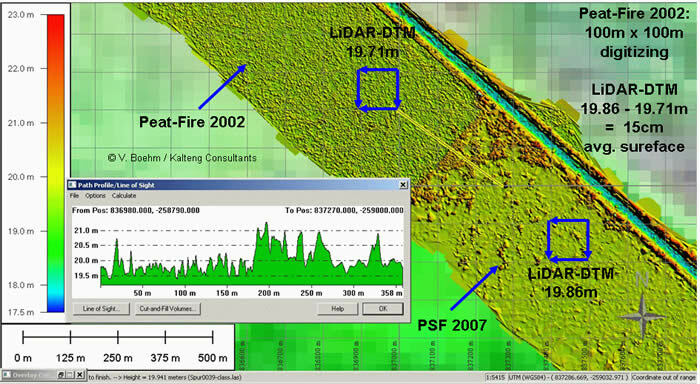 Presented at International Silvilaser Conference, Freiburg, Germany, 14-17 Sept.
Peat fires of 2002 were analyzed by LiDAR-technology (DTM) with 15cm depth in average, using a 100m Grid (1ha) digitizer tool of two areas located parallel to Taruna channel in Block C of Ex-MRP.